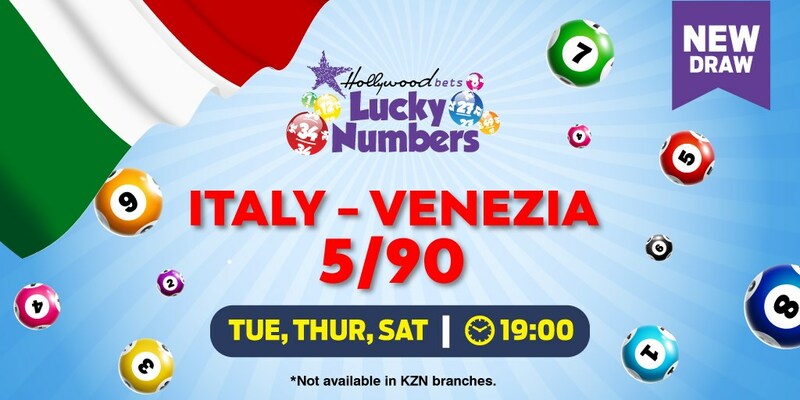 Bet on the Venezia 5/90 Lotto draw with Hollywoodbets* and Lucky Numbers! This Italian draw takes place every Tuesday, Thursday and Saturday at 18:00. There are 90 balls, with 5 balls drawn only (there is no bonus ball). Learn more about betting odds and results for this draw below. The Venezia 5/90 lotto draws take place every Tuesday, Thursday and Saturday. This draw can be found on Hollywoodbets under Lucky Numbers, and Italy. The result is published at 21h00 on the same day.